I love sweets, but my husband tends to go for salty snacks, so if I make a cake it sits until half of it gets thrown away. 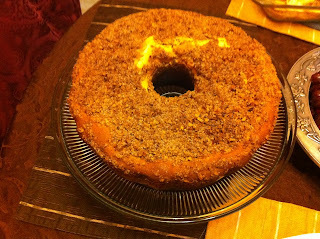 Coffee cake is one thing that we can both agree on, but I tend to make the same recipe over and over. This Easter I tried a new recipe from The Complete America's Test Kitchen TV Show Cookbook. I made this recipe before everything else on my Easter menu so that it had time to cool completely, even so it crumbled when sliced. 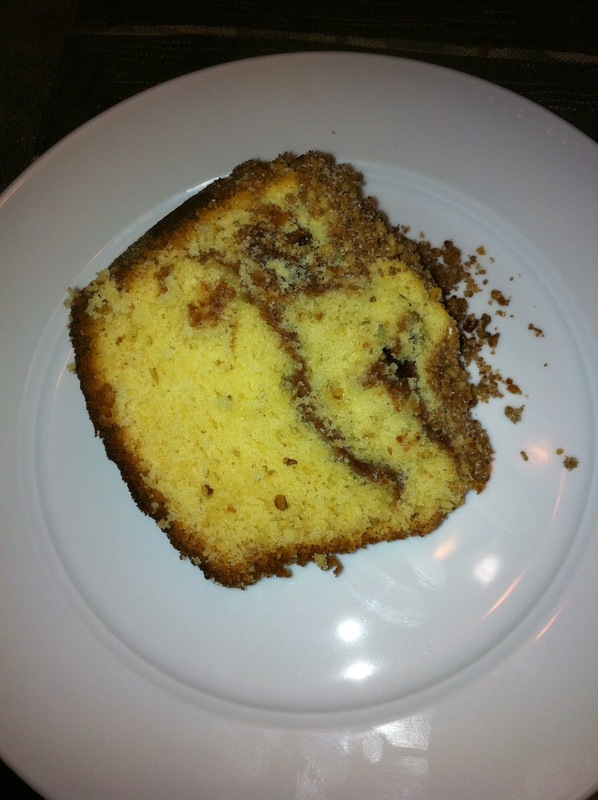 I would, therefore, recommend letting the coffee cake sit for a decent amount of time to ensure even cutting. The ingredients for this recipe are basic and were easy to find at any grocery store. The prep was more time consuming than similar recipes, with multiples appliances needed. For a normal day this would be fine, but since it was a big holiday meal, it did create quite a bit of a mess. The one change that I made to the recipe was to bake it in a bunt rather than a tube pan. I prefer the look on the table of the bunt shape for holiday gatherings. This was a quality coffee cake. The streusel filling gives the cake a unique quality and it isn't overly sweet. I would make this recipe again, just probably not for a holiday meal, since it creates a bit of a mess. The recipe can be found on page 441 of The Complete America's Test Kitchen TV Show Cookbook. The book can be purchased on Amazon. Yummy, looks delicious! I am originally from West Virginia - a little town called Kimberly just about 35 Minutes from Charleston. Nice to meet a fellow Mountaineer! Thank you for participating in the Get Wired Blog Hop! I am your newest follower. Hello there, officially following you from Wed. Blog Hop : ) ) .. Lovely Blog.. Excited to get to read more of your posts.. Hope you stop by sometime.. Marilyn from http://www.theartsygirlconnection.blogspot.com/ TY.. Thanks for following on Monday's hop, here to follow! Thank you for stopping by my blog hop. Looks delicious!!! New follower. All my best! Wow, that looks really good. Thank you for stopping by... new follower. Looks wonderful. New follower from bloggy moms. Stop in and follow back when you get the chance.